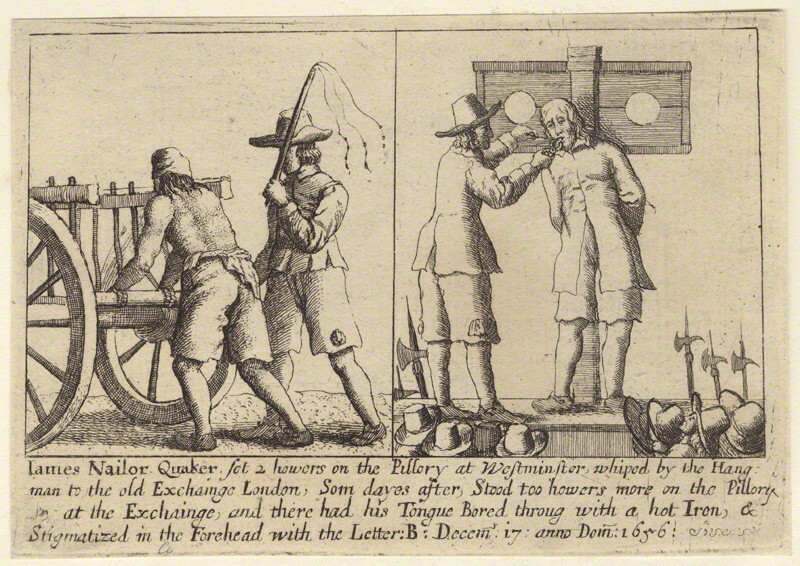 An actual Christian (James Nailor, Quaker) being persecuted by other Christians for not being the correct type of Christian. 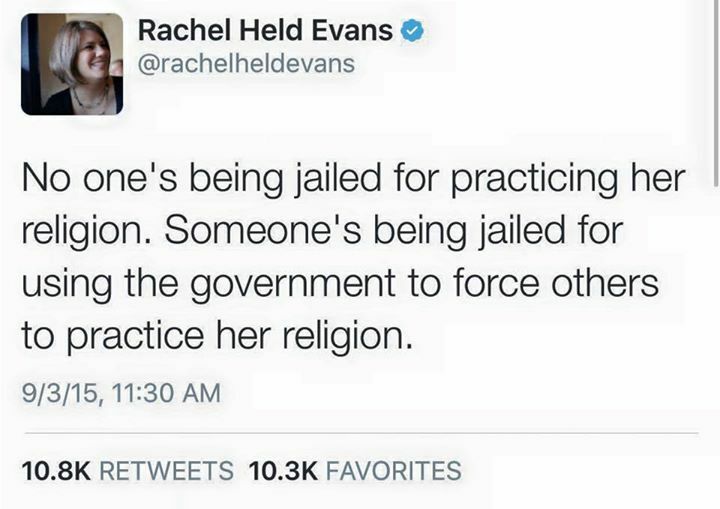 This is why we don’t just allow religious law to rule the day. Others have already dealt with the absurd belief that Kim Davis is being persecuted. But that leaves another question: What would the Founding Fathers do? 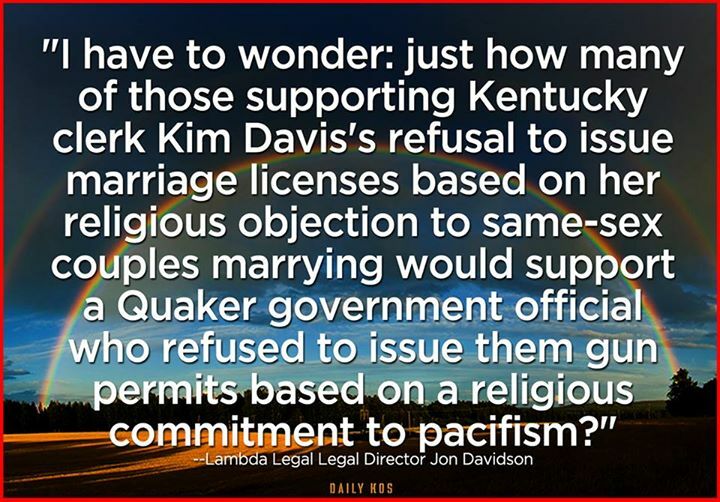 Would they actually hold Kim Davis’s sectarian beliefs above civil law? Well, we need only to look at the historical record to find an answer. At the time of the Revolution, large communities of Quakers and Moravians (mainly pacifists) escaping religious persecution in England and Germany (respectively) settled in Pennsylvania, a colony established upon the tenet of religious freedom. There were no laws subjugating Quakers as there had been in New England in the 17th Century and, unlike its neighboring colonies, Pennsylvania did not have a militia law. Thus none of the peaceful settlers would be forced to bear arms against their religious principles. Similarly, Pennsylvania’s religious freedom meant that no Quaker or Moravian or Mennonite would be forced to take an oath as oath-taking was strictly forbidden by the laws of their religion. However in 1777 that would change. Pennsylvania’s new Constitutional government passed two ordinances: the Test Act (requiring everyone in the state to take an oath of allegiance) and the Militia Act (a militia draft—service was compulsory). Bishop John Ettwein, spiritual leader of the Moravian community in Bethlehem, called the Test Act “the most absurd, tyrannical & wicked Law that ever was passed in a free County.” While many found ways to help the patriots, the Moravians and Quakers nevertheless refused to compromise their religious laws for civil laws and as a result they found themselves targeted by a needful patriot government and by their neighboring communities. Moravian diary records from Lebanon indicate that on June 30, 1777, two Moravians were killed for not taking the oath under the Test Act. In August of 1777, the Moravian church in Lebanon was impressed for use to house Hessian prisoners. Moravian leaders pleaded with local officials to find a public building more suitable, but the patriot officials would not listen. Those members of the Moravian congregation which refused to turn out for their militia draft under the Militia Act were fined heavily. Those who refused to bear arms (whatever they had to defend against American Indian raiding parties) against Great Britain were deemed ‘disaffected’ and their weapons were taken from them. Contrary to what Cruz believes happened in American history, Moravians were constantly being harassed and thrown in jail. In one instance, as the single brethren of Lititz sat down to a meal, a band of local militia arrived, armed, and one of them promptly read a group of names off a list—all whom were taken under guard. Fourteen Moravian men in all were forcefully removed from their table, their families, and their homes. These men were eventually marched to Lancaster, through a shouting crowd of people—Christians of other denominations—and were brought to the local meeting house where they remained, without reason, and given little food; they would not be released for two days. On March 20, 1778, during the height of the British occupation of Philadelphia, Washington ordered that Gen. John Lacey—the officer in charge of the Pennsylvania militia—should “by all means endeavour [sic] to interrupt” the Quakers attempting to enter the city of Philadelphia to attend their annual meeting. The subtlety of Washington’s request was not lost on Lacey; he would write back the next day that his light horse was ordered to kill any Quaker found going toward Philadelphia and to leave their corpses along the road as a warning to others. Yes, the man who would become our first president was perfectly fine allowing his subordinates to slaughter people who refused to adhere to civil law, even if it was in violation of their religious liberties. What is interesting about these accounts is that they represent actual cases of religious persecution. And the impetus behind these acts is simple: your right to your religion does not extend beyond the limits of civil law. If the state requires your cooperation, they will get it or else. This is something that these candidates, and Davis in particular, do not seem to understand. 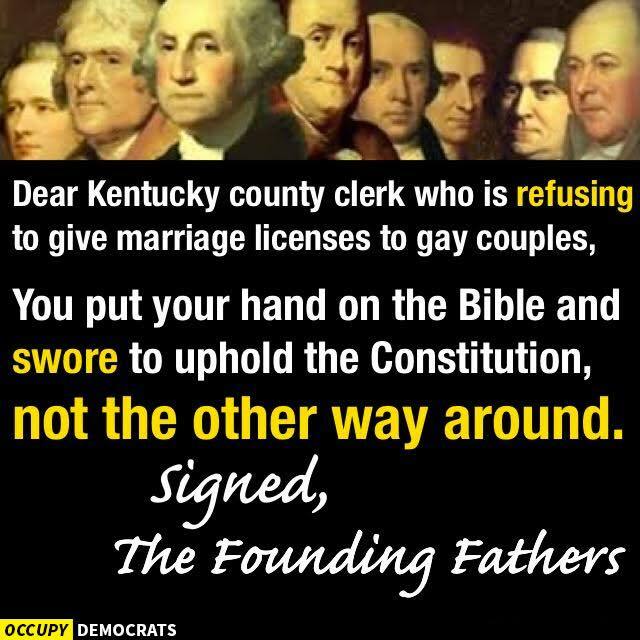 In Cruz’s same letter of support for Kim Davis, he argued “we are a country founded on Judeo-Christian values.” But the Founders stated the exact opposite in Article 11 of the Treaty of Tripoli, where one finds that “the Government of the United States of America is not, in any sense, founded on the Christian religion.” This treaty was drafted in 1796—not yet a decade after the ratification of the Constitution—and sent to the Senate floor where it was read aloud and unanimously agreed upon by all, signed by John Adams, and published in newspapers across the country. Davis is refusing to do something because of her sectarian beliefs; because her particular sect of Christianity believes marriage equality is a sin. But then the government of the United States does not function as a wing of the conservative evangelical church. At least, it shouldn’t—not according to the Founders. And that is why we have a separation of church and state. Because the second we start adhering to a single set of religious laws rather than civil laws, we’ve inadvertently destroyed the very foundation of our independence. We’d have turned our government, which permits everyone the right to worship privately as they choose, into a theocracy which would force all people, of all ethnic and cultural and religious backgrounds, into a semblance of a particular set of beliefs. But that isn’t what America is about–we are one out of many, not ‘all under the cross’. 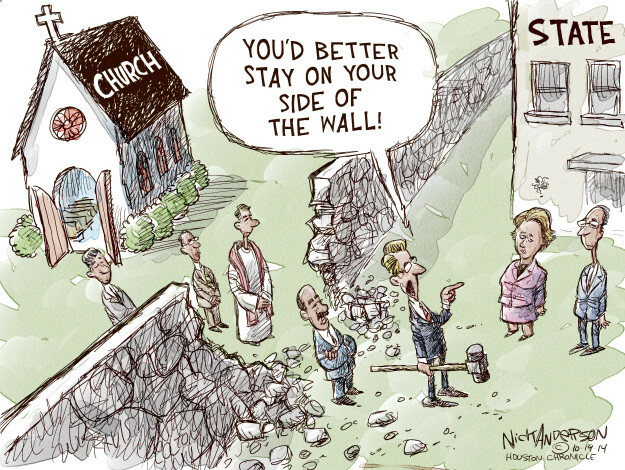 That is what church is for–not a Rowan County government building. And why should it? Evangelical Christians aren’t the only ones who pay taxes. ← Battle of Boone Homestead (August 15, 2015) – Pictures! It seems you share and excuse the venom toward religious people–persecution for their faith–that existed in Revolutionary War times. You excuse the act of forcing a civil servant to act against her faith or to lose her job, a rather ugly coercion, with all of the negative implications, based on a SCOTUS decree that came from on high after she swore to uphold the law as it existed when she was elected. I can think of nothing more unjust. Reference to the Puritans seems irrelevant since this is a discussion of the founders. So basically you just stopped reading after the first few paragraphs? Go back and read the whole thing. I have heard that before: that her oath was only to uphold the law as it existed the moment she made the oath. That is frankly ridiculous for many reasons. Do we have to have every civil servant reaffirm their oath every time a law is amended or overturned? Even if we did, she could not take that oath so should not hold that office. Bingo. If she can not perform the duties of her office under the law, she should resign. That is the Christian (and the ethical) thing to do. OK then by that logic, the Muslim flight attendant must quit–as should every woman Muslim whose veil interferes with her job. Muslim cabbies have to pick up people at bars or give up their medallion. If that is your point then you are at least consistent. You open an ugly door, however, and one which prompts close examination of our first amendment. 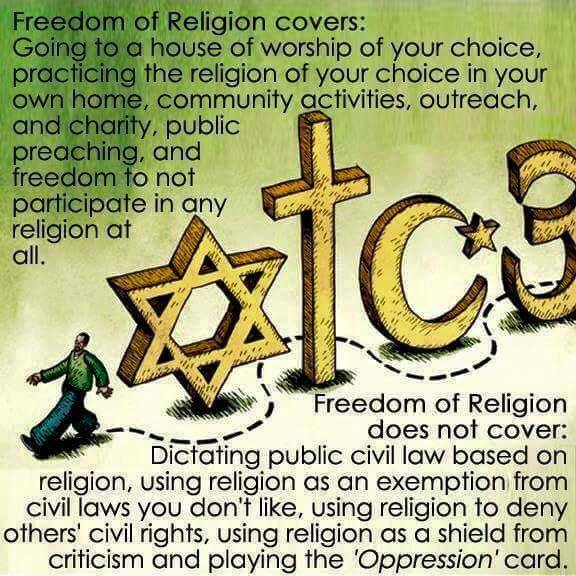 And yes, you do excuse the persecution of the religious by the founders, because you base your point upon the fact that they did it too, and you hold civil law above conscience in all events. Sorry, but clearly your grasp on logic is terribly lacking. In your scenario, no one has “to quit.” People have a choice–follow their religion or do their job. You don’t have to get a job that demands you work on Sunday if your religion forbids it. Many Orthodox Jews, for example, have jobs that do not require them to work on the Sabbath on Saturday. But that doesn’t mean *all Jews* follow religion the same way. Many of my more liberal Jewish friends work on Saturday because, hey, money. It is on the person to be responsible enough to know where their personal limits are. That said, a flight attendant isn’t a government job. They are not responsible for anything that might affect a person’s civil rights status. A Muslim flight attendant can do a plethora of other jobs and another attendant can therefore serve the drinks and no ones civil rights are violated. Maybe this is difficult for you to understand, but it is a really simple concept. A clerk issuing marriage licences who doesn’t want to do her job because she *wants to discriminate against other people* has dramatic consequences for those people who want to be married. Their civil rights are immediately violated. If a Muslim flight attendant refuses to serve drinks to Jews only, for example, then we have a situation where that flight attendant should be fired or disciplined because that is a clear prejudice. But even still, there are other flight attendants who can serve drinks–no one is being denied something. 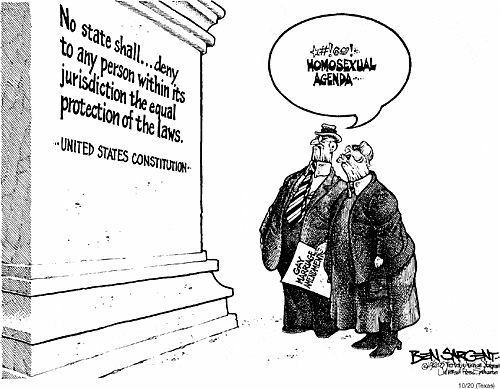 A clerk who orders their deputies to not issue marriage licenses because of her personal religious beliefs is, by definition, using ones government authority to discriminate against people. It’s a direct violation of civil rights. It’s a clear breach of the Constitution. If you can’t figure this out, well, then that’s on you. 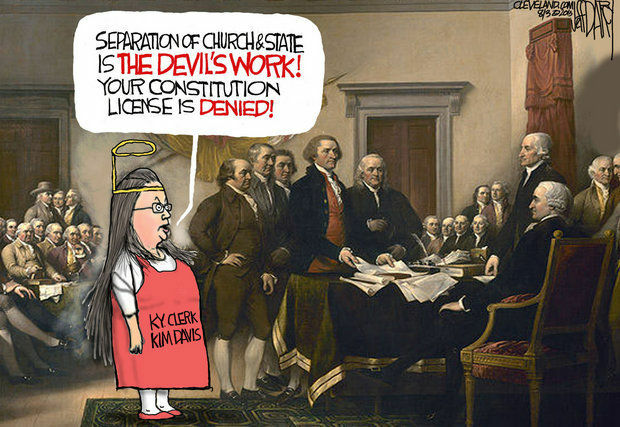 It’s worth noting that one of the reasons we had Disestablishment in the 1780s was because of the ongoing petitioning work being done by persecuted “dissidents” (Baptists, etc.,) in Virginia which ultimately lead to our notion of freedom of religion and separation of church and state at a time when the Anglican church was the official state religion in that colony . A careful reading of John A. Ragosta’s “Wellspring of Liberty” (Oxford, 2010) will help one situate how the Established Church of England (the Anglican state church) in Virginia led to widespread jailing, harassment, and persecution of hundreds of non-Anglicans during the pre-revolutionary period. In the Colonial period, Kim Davis would be seen as an Anglican persecutor, and Ted Cruz so gravely misinformed as to be a drunkard.